Ballynure Old Boys, the Ballymena and Provincial League Intermediate Division champions, signalled their intent to retain their title with a whopping 7-0 win in their opening fixture of the new campaign. Rathcoole were the unfortunate victims at Mossley where the Higgins brothers, Ricky and David, each weighed in with a brace. Ricky got the show on the road as early as the fourth minute when he tapped in at the back post, and midway through the first-half full-back Barry Penny doubled the lead from a Paul McIntyre pass. 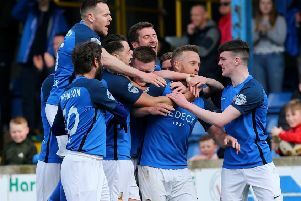 McIntyre was causing all sorts of problems down the left flank, and he was the provider for number three, when he set it up for David Higgins to volley in to the roof of the net from the edge of the box. Despite the lop-sided scoreline the match was evenly contested, with Paul Hughes having to make a couple of smart saves, but Rathcoole turned round four down. In the 40th minute Dan Ellis threaded the ball through for Ricky Higgins, to double his tally, but just before the break Hughes pulled off the best save of the afternoon with a stunning reflex save to deny a visiting striker. Two minutes into the second session Ellis got his name on the scorecard with a header from a David Higgins cross, and with the points safely wrapped up manager Gary Burns introduced all three substitutes. The impressive McIntyre made it 6-0 after dribbling round two defenders, and five minutes from time he was in the spotlight again when he crossed for David Higgins to complete the whitewash with a low shot. This Saturday Ballynure are away to Magherafelt Sky Blues while Rathcoole welcome to Newtowne - 9-0 winners over Sofia Farmer at the weekend - to The Diamond.